Rudolph Valentino has to be one of the best traveled spirits. From his mansions (one in Hollywood and Falcon's Lair in Beverly Hills) to his Ventura Beach House to hotels such as the Knickerbocker and the Santa Maria Inn, Rudolph Valentino has appeared almost everywhere in the Southern part of California. The weirdness continues with the ghost of his dog popping up in the LA Pet Cemetery and even the ghost of a Lady in Black visiting his grave at Hollywood Forever Cemetery. Valentino's ex-wife was apparently in contact with him for many years after he died and as if this wasn't enough, there's even a fabulous legend about a curse on one of his rings. 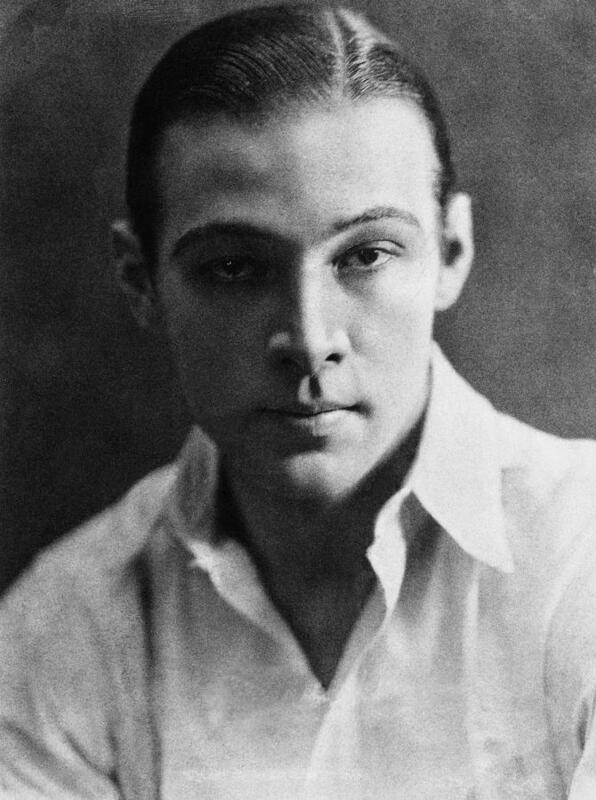 Rudolph Valentino died of peritonitis on August 23rd, 1926 at the age of 31 in New York City. Over an estimated 100,000 people turned out on the 24th to see Valentino and pay their respects, eventually leading to a full blown riot as windows were smashed. Police were deployed in addition to over a hundred mounted officers and for the remainder of the day, the streets were lined by police. Even inside, the funeral was filled with antics as a Fascist Blackshirt honor guard showed up claiming to have been sent by Benito Mussolini. This later proved to be a publicity stunt. Media constantly reported that the body on display was a decoy and not really Valentino, and Valentino's supposed fiancée, Pola Negri, collapsed while standing over the coffin. Eventually Rudolph Valentino was transported back to California, buried in Hollywood Forever Cemetery, and now haunts pretty much everywhere. We'll begin our tour of Valentino's haunts at Falcon's Lair, which is the former mansion of the famous actor. Located at 1436 Bella Drive in Beverly Hills, the actor had only lived there for about a year before passing away. Valentino purchased the home to live there with his wife of two years, Natacha, but she sadly divorced him before the home was even completed. So he used it as a retreat and stored various antiques there. After his death, the caretaker of Falcon's Lair used the house to hold staged seances and even late night ghost tours. Despite that this was all faked by the caretaker, stories of Rudolph Valentino still haunting the location persisted all the way until 2006, long after the caretaker left. Apparently Valentino had a hard time believing he was dead, because there have been many sightings of his ghost here at his old home. Supposedly, doors opened and closed soon after his death, and his dogs didn't react to it in any way, as if there was nothing wrong, and it was only their master wandering the house. 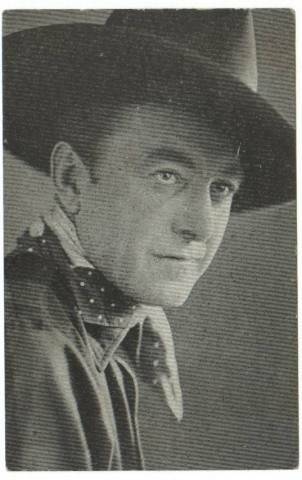 If you believe the stories, actor Harry Carey encountered the ghost while he owned the property, or at least had a hard time keeping staff since they all believed the house was haunted. Actress Millicent Rogers spent only one night in the house before she fled from the spirit. The ghost has been seen in the hallways, bedrooms, and stables of the house and passersby have seen Valentino watching LA from a second story window. Eventually in the 1950s Dora Duke (of the tobacco and energy fortune) moved in. She was an antique collector as well and bought all the pieces to Napoleon's war room, sent them to Falcon's Lair, and set them up just as the French General had done. She died in 1993 under strange circumstances, rumor having it that her butler killed her by drugging her with morphine. The same butler was named a beneficiary in her will and he lived there until he died in 1996. Afterwards the mansion was sold over and over again, eventually falling into disrepair. Now a days though, the main building of the Falcon's Lair has been long bull dozed (in 2006) and the property was last up for sale back in 2009 for a reported 7.95 million dollars. If the ghost of Valentino has moved on, it is anyone's guess, but he has plenty of other places that he chooses to haunt. Falcon's Lair's stables are located nearby at 10051 Cielo Drive. A stable worker quit right after seeing Valentino petting one of his horses. And the phantom horse has been seen on its own. Additionally, horse like sounds have been heard coming from the area. Next up is Valentino's Beach House. Located at 224 Cahuenga Street in Oxnard, Valentino lived in the house only briefly during the filming of the movie "The Sheik". It is now believed that the dark phantom wandering the veranda is Valentino. Valentino owned a villa at 6776 Wedgewood Place, Los Angeles, CA. Upon his death, the house remained empty, slowly collapsing, until only the foundation remained. However, during this time, the house earned quite a reputation as people would break in and hold seances or instead liberate their own Valentino souvenirs from the property. Valentino was to be buried in a grand memorial including several life sized statues of the actor. 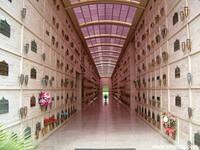 But instead was laid to rest in a temporary crypt that belonged to his good friend, June Mathis. She owned two crypts in Hollywood Forever Cemetery and Valentino was laid to rest in one while his permanent home was readied. She died a year later, and was laid to rest next to him. When plans for Valentino's memorial fell through, the family purchased his "temporary" resting place from Mathis's widower, and Valentino stayed where he was. If you believe the legends, Valentino appeared in the Mathis home the night he past away. The house was located at Laurel Avenue and Sunset Boulevard. 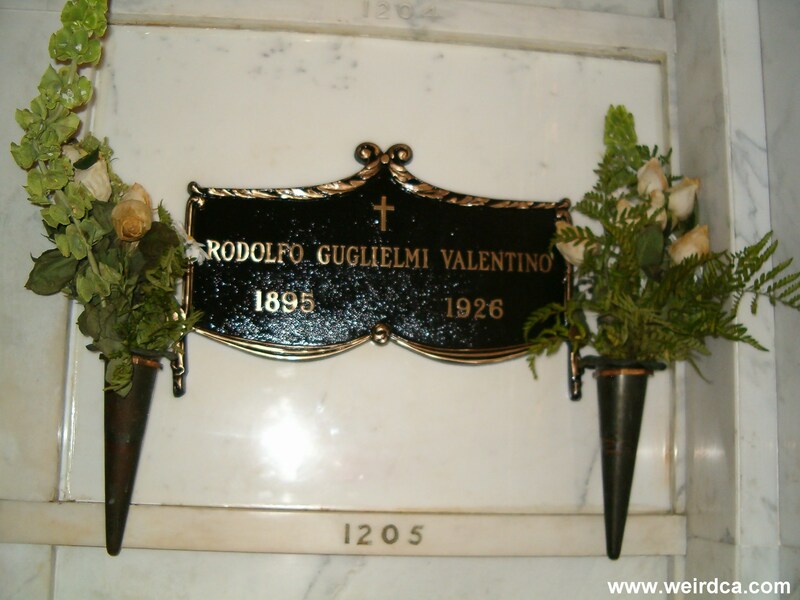 Valentino is buried in Hollywood Forever Cemetery, where the weirdness continues, as there have been multiple sightings of a Lady in Black visiting his burial site. This has eventually led to a yearly memorial service with multiple Ladies in Black arriving at the cemetery each year. Hollywood Forever Cemetery harbors other ghosts and spirits, plus the graves of countless actors and other famous people. Also the specter of Rudolph Valentino has been seen walking through the walls of the Hollywood Forever Cemetery and into Paramount Studios on the other side. 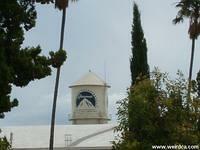 He also has been seen by security guards strolling in through the Lemon Grove Gate. And he's been seen in the costume department as well as other parts of the studio. Of course, Valentino never worked at this studio, as Paramount didn't move to this location until after Valentino died. Paramount was located near Sunset and Vine before they moved to their current location. His body is buried just on the other side of the wall though, so perhaps his ghost is curious about what goes on in the movie industry now a days. One of the statues that was being built for Valentino's memorial that never happened ended up in De Longpre Park. It was set up in 1930, and for some reason a second statue, a bust of the famous actor, was erected in 1979. Valentino never hung out in this park nor did he know Paul De Longpre for who the park is named after. Two people have been found dead in the park. One a 14 year old girl was found murdered in 1931 on a bench near the statue and the other was an apparent suicide of a thirty one year old woman in a rest room near the statue. If these bodies were connected to Valentino in any way is unknown. At 716 Valentino Place in Hollywood, lies an apartment building dubbed Valentino Place that was rumored to be a speakeasy back in the twenties that was often visited by Valentino (however, the building in actuality wasn't even built when Valentino was alive). The story goes that in April 1989, a twenty eight year old actress was living there, and was awoken during the night by someone sitting on her bed and climbing under the sheets with her. She heard heavy breathing, and upon lifting the sheet saw Valentino there. She fainted and upon waking up Valentino was no longer there. Other tenants have claimed to see Valentino walking the apartment's halls and often resting in beds throughout the building. I believe the building has been acquired by Paramount Studios now and has been converted into office space and called the Valentino Building. Valentino haunts several hotels including the former Knickerbocker Hotel, which was also later the site for the Houdini séances for many years. The Knickerbocker is now apartments but Valentino has been seen all over it. Even stranger, the Knickerbocker didn't open until June 1929, almost three years after Valentino's death, but still the stories state he haunts the place. 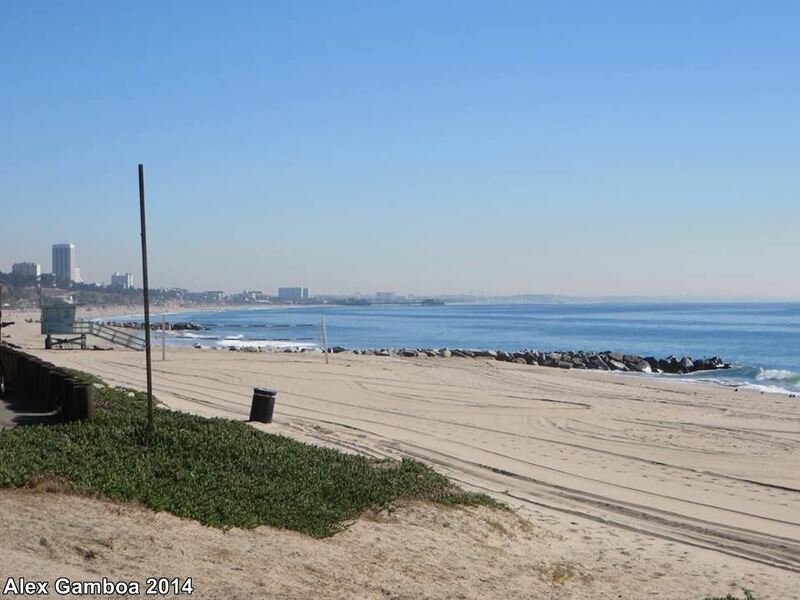 In addition to haunting his old stables, Valentino's horse has been seen on this beach too. The ghost of Valentino all done up in white with a red rose clenched in his teeth has been seen riding over the beach on his white ghost horse. Rudolph Valentino additionally lurks in the Santa Maria Inn, a hotel he visited in order to get away from the Hollywood and LA areas. Although reports state he haunts room 210, room 221 is the room which his star adorns the door. He can be found sitting or lying on the bed, knocking on the doors and walls, and all around relaxing in what used to be his room when he visited. The Santa Maria Inn also contains several other ghosts and hauntings. 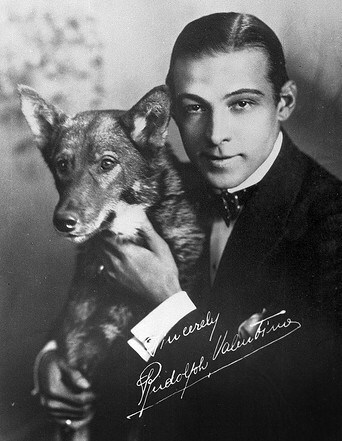 In addition to the Knickerbocker and the Santa Maria Inn, Valentino haunted the Hollywood Hotel. He is said to have hung out in room 264 and if you stayed the night, he was suppose to appear next to your bed and give you a kiss. The Hollywood Hotel was razed in 1956. Now it is home to the Hollywood and Highland Center. Valentino has been seen lurking around the bathrooms of this very old restaurant. Women will go to the bathroom and see a man hanging around the restroom door. He will smile at them and then vanish. He is wearing tan slacks, a white shirt, and a tie. In life, Valentino would often ride his horse to this location too. And if Valentino and his horses weren't ghost enough, his dog, Kabar, runs around the LA Pet Cemetery in Calabasas licking people's hands. There's also an MGM lion buried there. 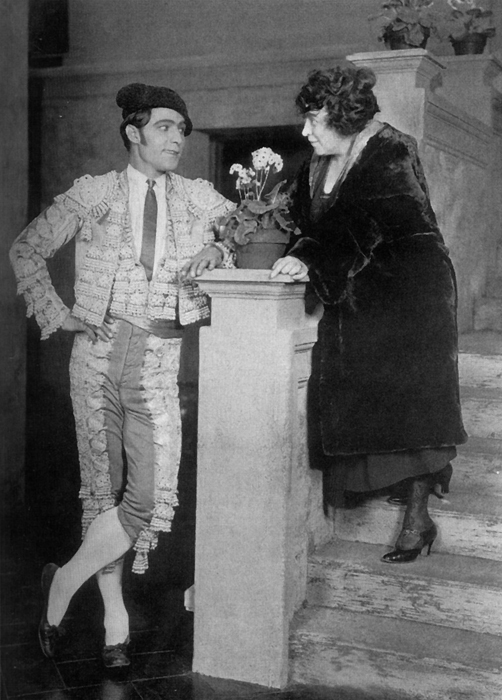 The ghost of Rudolph Valentino has also been seen at the San Fernando Mission, the Alexandria Hotel, the Roosevelt Hotel and the Montmartre Cafe. And although it might just be an Internet hoax, Valentino's ring has been attributed with a curse, having been worn, according to the stories online, by multiple people shortly before their death. The ring has been rumored to have ruined careers, led to people's deaths, killed thieves, caused bank robberies, and even led to fires and a union strike! The current whereabouts of the ring are currently unknown.